I typically think politics belong in late-night Facebook posts and arguments with my Granddad, and certainly not in my board game sessions. There are few things more divisive than a quick chat about energy policies, or the role of government in healthcare, or the more hot-button issues that we yell about every day. Somehow, Campaign Trail manages to avoid all of this negativity, while capturing the fun of watching the twists and turns of a Presidential campaign. Republicans have a 15% lead in Illinois? Just wait until the Independents launch their huge ad campaign and claim the state. Democrats are polling well on Environmental Issues in California? Great, but they've been overtaken by the Republican candidate with a strong message on international trade. These swings and targeted strategies push and pull electoral votes (the score markers in the game) and create some of the most compelling drama I've felt in a game. Keep reading, and I'll go into a bit more detail about what I like in Campaign Trail. 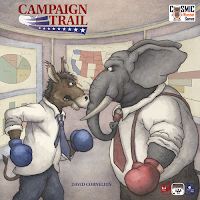 Updated Update: Campaign Trail is now live on Kickstarter, with a lower price, free shipping in the US, and a deluxe version available that I've happily snapped up. Check it out by clicking here! I've played Campaign Trail twice, in a two-player game with Amy and in a six-player game at our regular game night. I thoroughly enjoyed both, and for different reasons. The two-player version pits a Democrat vs. a Republican in a cutthroat competition to influence states until election day, at which point each player gets a final chance to gather support (in the form of voter cubes on the board) before the final tally. The two-player game is VERY swingy - Amy once led by more than 300 votes out of 539 - but managed to make me feel like I was a turn away from reversing her momentum and getting voters back on my side. I ended up winning because of a strong second debate (more on this in a moment) and a crazy election day strategy that worked perfectly for me. I stole Texas (38 votes), Florida (29 votes), Pennsylvania (20 votes) and Ohio (18 votes) on the final day, a 95-vote swing that gave me the victory. It was intense, it was captivating, it was on-the-edge-of-your-seat drama as we both revealed our final plays (Election Day happens sort of simultaneously) and counted up the votes. I LOVED it. Look how cool this scoring track is! The six-player game puts players in three President/VP teams, representing the Democrats, Republicans, and Independents. I taught the game to the other five players, and it took us a little under two hours to learn and complete our game. It was just as riveting as the two-player game, and the teamwork was awesome. I love playing team games because of the camaraderie shared between teammates, and it's always a great feeling to have another player completely invested in the narrative of the game with me. Campaign Trail delivered 100% on what I hoped it would - a no-hold-barred fight to the finish line for the Presidency. There are two debates during Campaign Trail, which aren't actually out-loud debates, but a strategic battle of card play as candidates "speak" to issues that matter to the voters. These debates are hugely important in establishing and/or protecting leads in the states interested in the debates. The game's mechanic for these debates includes a couple cards played in turn order, which feels a nice break from the rest of the game without overstaying its welcome, or feeling too much like upkeep. It's balanced, interesting, and rewards long-term planning without overly punishing players who were less-prepared. I love everything about this map. I'm shocked at how immersive and entertaining Campaign Trail is. I've backed the game at the highest tier, and provided that it funds, I'm going to use that tier to work my Mom into the game, who has a political science degree and used to watch election coverage with me when I was growing up. She introduced me to The West Wing (my favorite TV show of all time) and spent hours watching the 2000 election (and recount aftermath) with me before I headed off for college. I can't wait to share this game with her, and re-visit some of my favorite memories with her. Speaking to that family narrative, Campaign Trail was designed by David Cornelius, and is now being published by his sons, Jeff and Nathan. They've been playing this game for most of their lives, and actively developing it for half a decade. I love Kickstarter for how personal dreams can be accomplished through preparation and successful campaigns, and this one is no different. I'm happy to support creators who are fulfilling a lifelong dream. Campaign Trail is surprisingly accessible for casual gamers, wonderfully immersive, and creates a compelling (and sometimes gut-wrenching) narrative. I encourage you to check out Cosmic Wombat's game on Kickstarter for yourself, and place your vote for Campaign Trail!